Srixon Z765 10.5 Driver. Graphite Shaft - Miyazaki Tour Issue Regular R Flex. All single pieces (drivers, fairway woods, hybrids, single irons, wedges, putters. Grip - Golf Pride. ). NEW SRIXON Z785 9.5 DRIVER - HZRDUS PROJECT X 6.0 STIFF GRAPHITE SHAFT. The club comes with a headcover, adjustment tool and instructions booklet. Winning bidder will pay $15.00 anywhere within the Continental US. 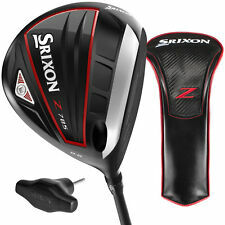 Srixon Z745 Driver 8.5 degree. Condition is Used. Shipped with USPS Priority Mail. Mitsubishi Kuro Kage 60 gram stiff flex shaft, Golf Pride tour wrap jumbo grip. Headcover included. Weight set 3 gram, 7 gram and 11 gram with tool. Graphite Shaft -Project X Hzrdus 62 Stiff S Flex. Srixon Z585 9.5 Driver. All single pieces (drivers, fairway woods, hybrids, single irons, wedges, putters. ). Project X BLACK HZRDUS Driver shaft (6.0) with Srixon Z-565 10.5 Driver head. Head Cover and Wrench included - NEW WINN grip installed. 4.5 out of 5 stars - Project X BLACK HZRDUS Driver shaft (6.0) with Srixon Z-565 10.5 Driver head. 6 product ratings6 product ratings - Project X BLACK HZRDUS Driver shaft (6.0) with Srixon Z-565 10.5 Driver head. Srixon Z-355 9.5° Driver Matrix Ozik HD5 Graphite Shaft . The club is still in good shape. The shaft is a upgrade one which I think is either extra stiff or just stiff. Professional grip also in good shape. No headcover or wrench. Grip: Srixon. Shaft: Kuro Kage Graphite. 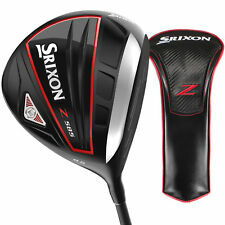 Srixon Z 745 Driver 430cc. Z 745 Driver. Titanium Cup Face. Ball Speeds Have Been Maximized With Advanced Face Construction. A 6-4 Ti Cup Face In The Z 545 Driver Enlarges The Sweet Spot While Increasing Cor. NEW head still wrapped in plastic - Srixon W302 9.5 Driver. Srixon SV300 Tour Light 68g, 3.9 Torque, BP.MBP, Stiff Flex Graphite Shaft. Has Aroe Feel Grip. Condition: 7 out of 10 - Good: These clubs/iron sets have been played in an appropriate fashion. The wear is typical for an item of similar model/age and has been well taken care of to date. Ball wear is visible only on the face, with the only signs of wear primarily associated with the face and sole of the item. Headcover - Included (No Wrench). The face is still in excellent playing condition! Adapter - Included. FREE scheduling, supersized images. Over 100,000,000 served. Shaft: Project X Hzrdus, 5.5, 62g., Graphite. Model: Z585, 9.5º Driver. Manufacturer: Srixon. Condition: Lightly used and in excellent condition. Likely only hit once or twice. No dents, dings or skymarks. Srixon Z-F65 9.5° Driver. Graphite Shaft -Miyazaki Stiff S Flex. All single pieces (drivers, fairway woods, hybrids, single irons, wedges, putters. Headcover Not Included / Tool Not Included. ). Grip: Golf Pride Tour Velvet 360. Maple Hill Golf. All Imagery & Content ©2013 Maple Hill Golf. Complete Sets. New Stretch Flex Cup Face - Face has been extended farther around crown and sole to create a larger sweet spot. Center area of face (sweet spot) has been milled down to a Cor of. 860 leaving the ends at manufactures thickness preventing face cracking. Condition is 8.0 to 8.5 out of 10 no head cover or tool. Total Driver length is 45.5" This Driver is a bomber enjoy. SRIXON Z565 DRIVER. National Golf is an authorized Srixon Golf dealer. SHAFT WEIGHT: 65g. LOFT: 9.5 . SHAFT FLEX: STIFF. SHAFT: FACTORY PROJECT X EVEN FLOW BLUE GRAPHITE. 7: NORMAL WEAR FOR AGE, STILL IN GOOD SHAPE WITH MANY MORE ROUNDS LEFT. Shaft - Aldila NV 2KXV Orange 75 X-Flex Graphite. Grip - Golf Pride New Decade. Lighter scarring on the sole from normal use and the face is still in excellent playing condition. Used right hand Srixon Z355 driver. Loft is 10.5 degrees. Shaft is the Miyazaki graphite shaft in regular 7335 flex. Grip is midsize. Condition is very good, I would rate 8 out of 10. Headcover included, no torque wrench. Srixon Z 355. Grip: Srixon. Miyazaki Stiff Flex Graphite Shaft. 9.5° Driver. USED--Good Condition. Top Of head shows scratch marks. SEE PICTURES. SHAFT: FACTORY HZRDUS YELLOW GRAPHITE. SRIXON Z765 DRIVER. National Golf is an authorized Srixon Golf dealer. SHAFT WEIGHT: 76g. LOFT: 9.5 . SHAFT FLEX: STIFF. 6: MORE VISIBLE AND OVERALL WEAR. STILL HAS DECENT AMOUNT OF USAGE LEFT IN IT. Grip - Srixon Golf Pride. Shaft - Factory Miyazaki Jinsoku 57g Stiff Flex Graphite (8446). Dexterity - Left Handed. A couple scratches to the paint on the crown and a few tiny nicks to the paint on the crown. SRIXON Z 745 10.5* DRIVER RH KURO KAGE 60g STIFF SHAFT NICE! Priority US ship! Mitsubishi KURO KAGE 60g stiff flex graphite shaft. Very nice used driver. Look at the pictures - nice club! Right Handed. see pictures. 10.5 loft. SRIXON Z 745 9.5* DRIVER RH KURO KAGE 60g STIFF SHAFT NICE! Priority US ship! Mitsubishi KURO KAGE 60g stiff flex graphite shaft. Nice used driver. Look at the pictures - nice club! see pictures. 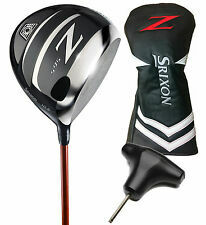 Srixon Z-355 9.5° Driver. Graphite Shaft - Miyazaki Extra Stiff X Flex. All single pieces (drivers, fairway woods, hybrids, single irons, wedges, putters. Headcover and Tool are Not Included. ). The Srixon Z 565 driver promotes a higher launch with more forgiveness and slight draw bias. Grip: Golf Pride Tour Velvet 360. Maple Hill Golf. All Imagery & Content ©2013 Maple Hill Golf. Complete Sets. Srixon Z565 Driver Miyazaki JDL Tour Issue 6S Stiff 5543 9.5 RH Cover/Tool -1/4"
Light scratch on top. Shaft is very good with good tacky golf pride G2 grip. Driver, tool and headcover. If it's not pictured, it's not included. 9.5 RH KuroKage 60 Extra Stiff. Quick Tune System allows everyone to easily adjust the loft, lie, face angle and center of gravity settings. 12-way hosel to tune face angle and lie along with loft. The shaft is Kuro Kage 60g X-Stiff Flex Graphite Shaft. Matching H ead Cover is included. Tour Issue Srixon Z745 9.5° Prototype 5 Driver. Miyazaki Prototype X Flex Graphite Shaft. Tour Issue Prototype 5 With Tour Serial Number. Good / 7 of 10. RH Srixon Z765 9.5° Driver Miyazaki Tour Issue Graphite Stiff Flex S-Flex.plastic is off club but is new . Shipped with USPS Priority Mail. Srixon Z355 Driver 12* Kuro Kage 60G Stiff Flex Mens RH Adjustment Tool!! Srixon Z 355 Driver. Kuro Kage 60G Stiff Flex Shaft. This club is 100% authentic! 12 Degree (Adjustable). We only deal with 100% authentic products with no exceptions! Srixon Z 585 9.5 Driver w/ HZRDUS Red 62g 6.0 Stiff Flex RH. Shaft - Project X HZRDUS Red 62g 6.0 Stiff Flex Graphite. Very light scarring on the sole with the face still in excellent condition. FREE scheduling, supersized images. It has a bare spot on the heel. The shaft is Kuro Kage 60g Stiff Flex Graphite Shaft. Matching H ead Cover is included. Srixon Z 745 9.5 Driver. Graphite - Kuro Kage 60g Shaft (Stiff). All single pieces (drivers, fairway woods, hybrids, single irons, wedges, putters. No Tool or Headcover Included. ). SHAFT MODEL Mitsubishi Rayon Fubuki Z 60. MODEL Z 765. The Z 765 driver is 445cc and features a Power Wave Sole that contains an advanced multi-step design that allows the entire sole to flex, which enhances COR especially on low impacts. Condition is Used. New grip from late last season. No head cover. Great driver, but I just got fitted for one. For sale Srixon Z355 Senior Flex 12 Driver with Miyasaki Graphite shaft, made in Japan and Golf Pride. CP2 Wrap Mid size grip. Driver is in Very Good condition and well maintained. Tour Issue Srixon Z765 9.5° Driver. Tour Issue With Tour Serial Number. Matrix Black Tie 6M3X-Flex Graphite Shaft. Very Good / 7.5 of 10.